How do Positive Views Maintain Life Satisfaction? This study proposes three mediation pathways to explain how the positive views (perceived control, optimism and self-enhancement) proposed by Cummins and Nistico (Journal of Happiness Studies 3:37–69 2002) maintain life satisfaction. The three pathways were enhancing self-esteem, reducing have-want discrepancy and changing importance perceptions. Two hundred and seventy-two undergraduates from Central Taiwan University of Science and Technology and Nan Kai Institute of Technology voluntarily participated in this study. 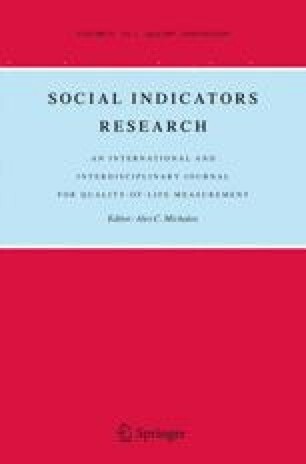 Questionnaires measuring sense of control, optimism, self-enhancement, self-esteem, have-want discrepancy and importance of life domains, and global life satisfaction were administered to participants in a classroom setting. Correlation and structural equation modeling analyses were conducted to examine the mediation effects of these three pathways. Generally, results of correlation and structural equation modeling analyses were consistent with hypothesized relations among variables and showed that the relationship between positive views and life satisfaction was completely mediated by self-esteem, have-want discrepancy and shifting tendency of importance perception, indicating that the three pathways of enhancing self-esteem, reducing have-want discrepancy and changing importance perceptions had unique effects to explain how positive views maintain life satisfaction. This research was partially supported by a grant form the Central Taiwan University of Science and Technology (CTU97-P-24) to Ying-Mei Tsai.